Let’s face it, Overland Park is starting to become one of the most popular destinations in the Kansas City Area. We can help you target this market. The City of Overland Park has been leading the way in terms of new business growth for many years, though, what if you were attempting to target this local market with search engines? Nowadays, you have options. Whether you are attempting to target a certain type of buyer or a specific geographical location, we can help you when you’re in our coverage area for SEO in Kansas. Overland Park (“OP” known by locals) has been attracting new companies over the years. When companies move to OP, they attract more and diverse customers. More customers entering the area results in more data gained from location-based searches, and then reviewed by our team. By reviewing this data about Overland Park, we can then recommend content to create for you in order to attract all the web traffic for those new search terms that people are using in search engines relating to Overland Park, KS. Learn more about our Kansas City SEO Agency, and see whether we might be a great fit for your company. Would you believe that are a lot of people in the Kansas City Area using search engines? The data from Google Trends proves that Overland Park is on the right track. For the past several years, there has been persistent interest in the City of Overland Park. This trend is likely to continue with the growth over the next years. Could this also provide business opportunities? We believe so. Small businesses can capitalize on the growth of Overland Park in many ways. When small businesses put together a sound plan, they should be able to expect returns from this local market. With help putting together your SEO Strategy, click here for the guide. The trend of local peoples’ interest in “Overland Park”-related searches remains strong. All it takes is some effort and ideas in order to target this and related search markets in the Johnson County area. Where are you at in Overland Park? Search engines are probably tracking you, and we’re probably tracking them. When you track the search engines, you can start to see new things that people are asking search engines. As SEO Specialists, we actually track the new questions and search terms relating to “Overland Park KS”. When search engines discover new search terms, this is often an opportunity for our local clients. When there are new terms relating to your local business, you want to get on the opportunity before anyone else does! By considering the specialities of SEO that can be applied for your business, you’re going to be showing up higher in search results and get more customers from search engines. You can contact us to learn more how to execute a winning search marketing campaign. 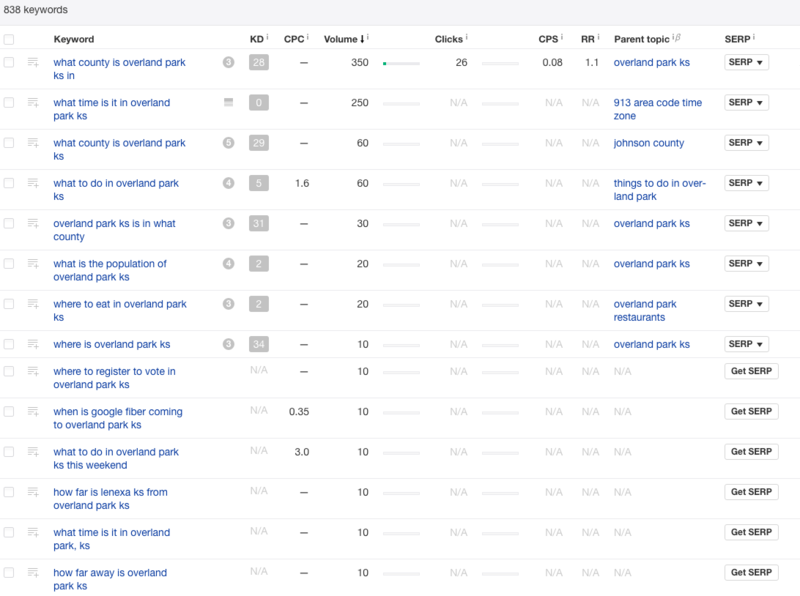 This image shows a recent keyword research report we ran for “overland park ks”. As you can see, we gained 838 new questions and search terms about the city. These hundreds of ideas translated into about tens (e.g. 40 or so) actionable content ideas for improving the search rankings for our local clients. Would you like to discuss your project? Let’s set-up a time.